CCAvenue is one of the oldest and probably the most widely used payment gateway in India. General impression has always been that CCAvenue has not been too SME friendly and catered mostly to larger online store-fronts. Looks like they have now re-invented themselves with a sleek designed website and 360 degree offering for anyone who wants to start selling their products online. 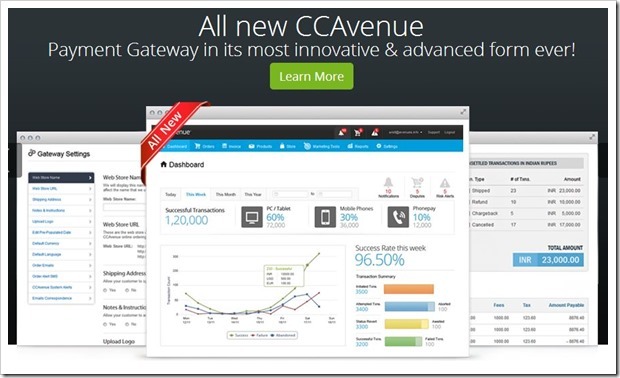 The new features CCAvenue has started offering includes multi-currency support, easy customizations and integrations, dynamic routing for higher success rates, storage of payment details for 1 click checkouts, DIY storefront builder, easier iFrame integrations & multi device support. Now, storefronts can start accepting payment globaly with CCAvenue. They have now started supporting 27 major foreign currencies allowing the customers to pay in the currency of their choice. The accepted currencies (apart from rupee) include USD, Pound Sterling, Riyal, Dinar, Franc, Baht, Rnggit, Taka, Yen Shilling, Peso and South African Rand. The new CCAvenue smart system detects the best performing gateway in terms of success rates and routes your transaction through it. In event of downtimes, scheduled maintenance breaks, load on the bank servers etc., their intelligent algorithms identifies the drop in success rates and automatically routes transaction through another bank’s gateway. This is probably one of the most helpful features of new CCAvenue, where the customer does not have to go through the entire process of payment processing again, when a particular transaction fails. A simple retry option allows user to execute the entire process in one click without having to fill in details again. A huge time saver for sure. Another important feature in the new CCAvenue system allows customer to store their credit card details with the merchant/s in a PCI compliant environment, so next time they make a purchase, they can avail 1 click check-out option. Card details are saved in an encrypted form and returning customers have to only enter the CVV and 3-D secure password when doing their next transaction. For customers who do not have a website, CCAvenue has also launched a storefront builder which allows even a non technical person to create their ecommerce store-front with minimum of web design knowledge. The storefront allows unlimited product uploads and has responsive design elements for multi-device support. Along with the new integration API’s, CCAvenue has also developed plugins for 18 third party Shopping carts that include Magento, BuildaBazaar, MartJack, Opencart, Drupal, Moodle, Zencart and even WordPress. This interesting feature allows CCAvennue customers to get a comprehensive picture of overall health of their online business as well as the visibility of their brand on leading Social Networks. It offers SEO Audits, website uptime stats and monitoring, Social Media Management & analytics. If the things mentioned on the new website are believed, CCAvenue now comes across as the one-stop solution for anything and everything that any seller may require to sell their products online. I am personally impressed with this new revamp, which could be termed as a 360 degree and most comprehensive offering compared to any other payment gateway in India.